There are 50 days left in the PGCBL regular season, which ends on July 30. Saugerties 5 Amsterdam 4: The Saugerties Stallions scored two late runs to go on and defeat the Amsterdam Mohawks, 5-4, for their fourth win in a row. The game was scoreless until the top of the fourth when a Clint Hardy RBI double scored Pat Dorrian and then a John Novenche RBI single scored Hardy to make it 2-0 Stallions. Amsterdam got a run back in the fifth on a Tyler Kirkpatrick solo home run. Novenche hit another RBI single in the sixth to make it a 3-1 game, but a Riley Mahan RBI double and a Hunter Tackett RBI single tied the game at three in the home half of the inning. Dalton Dahley tossed a scoreless eighth inning to earn the win for Saugerties, with Matt Wojciak notching the save. Kyle Smith allowed the two runs in the top of the ninth to take the loss for Amsterdam. Glens Falls at Mohawk Valley: The game was postponed and will be made-up on June 13 with a doubleheader in Glens Falls. Newark at Albany: The game was postponed and will be made-up on July 16 with a doubleheader in Newark. Adirondack at Utica: The game was suspended in the bottom of the fifth inning and will be picked up on June 19 as part of a non-traditional doubleheader. 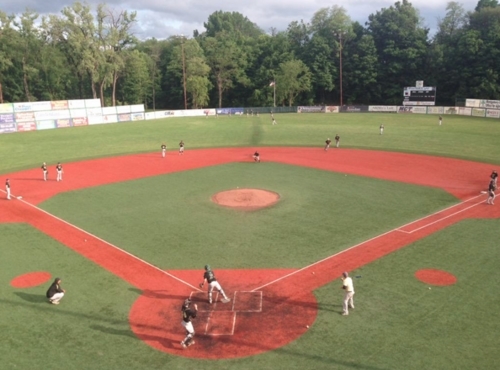 Mohawk Valley at Utica 6:35 p.m.: The Mohawk Valley DiamondDawgs, who had their game rained out on Tuesday, will travel to Utica on Wednesday to take on the Brewers, who had their game suspended on Tuesday. Albany at Amsterdam 6:35 p.m.: After losing two straight games, the Amsterdam Mohawks will face the Albany Dutchmen, who are 2-0 against the Mohawks this year. Glens Falls at Saugerties 6:35 p.m.: The Saugerties Stallions will look to keep their four-game win streak alive on Wednesday, playing host to the Glens Falls Dragons. Victor at Adirondack 7 p.m.: The first place Victor RailRiders will take on the Adirondack Trail Blazers at “The Smith” on Wednesday, looking to get back into the win column after losing on Sunday. Newark at Elmira 7:05 p.m.: For the third time in five days, the Elmira Pioneers will square off. Newark won the matchup on Saturday by a score of 9-6 and the Pioneers topped the Pilots on Sunday, 10-6.